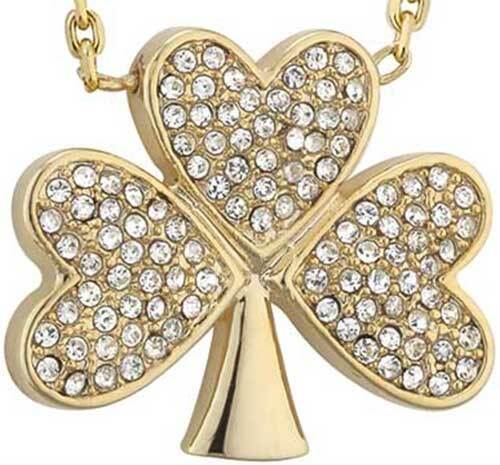 Shamrock pendant is a gold plated necklet style design that is enhanced with CZ stone studded leaves. 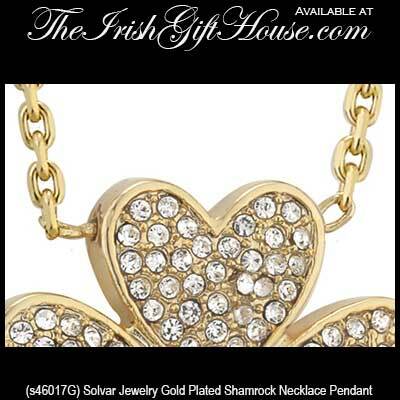 This gold plated shamrock necklace features leaves that are studded with CZ stones and measures 3/4" wide x 3/4" tall. The necklet style shamrock pendant includes a 19" long gold plated chain with a lobster claw catch along with a 2 1/2" chain extender with a tiny shamrock tassel on the end. Gold plated shamrock earrings are a drop style that feature CZ stone studded leaves.